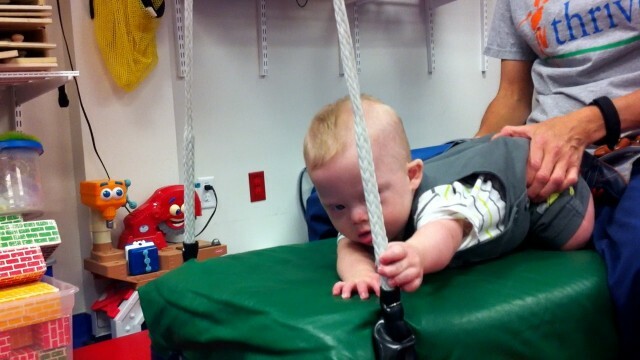 Noah Hits The Physical Therapy Trifecta Today! You are here: Home / Therapy / Noah Hits The Physical Therapy Trifecta Today! Thankfully one one of the day we’ve been able to schedule Noah’s occupational and physical therapy visits on the same day which is nice since it means that we only have to drive to his therapy appointments three times a week instead of four. Truth be told since Noah has such great therapists who are committed to helping him succeed, we don’t mind taking him at all…even if we did have to drive there four times a week. We’re just thankful for all the incredible therapies that are available today for kids like Noah. He makes it look so easy...! 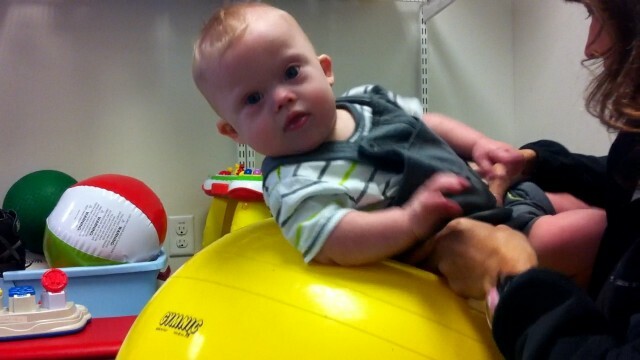 We’ve already talked about the effectiveness of an exercise ball for children with Down syndrome so it should go with out saying that we think it’s awesome! It can greatly help with your child’s balance, reaction, core strength, propping, and lots more!Not to mention it can be combined with one of our favorite toys for a cheap and easy physical therapy exercise you can do at your own house. 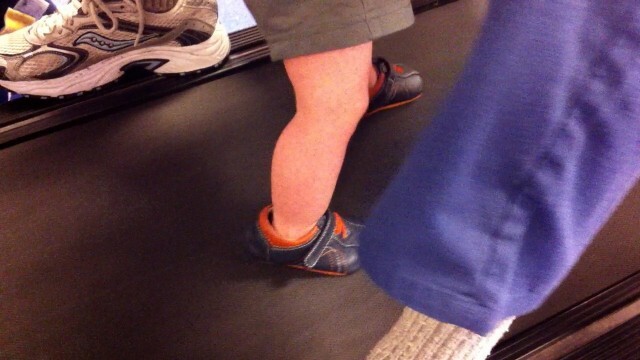 Only 10 months old, and already rocking the treadmill! 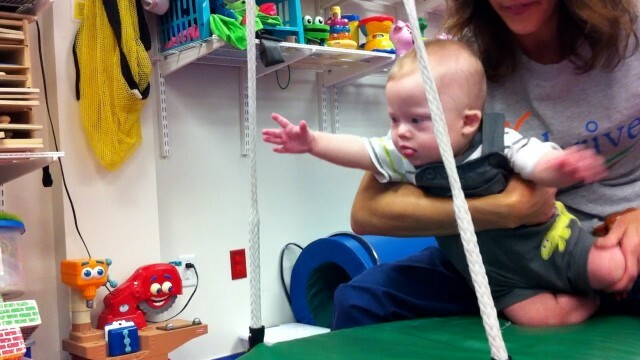 Wow…Now that’s the sort of stuff that gets me excited about the future of children born with Down syndrome! I’m thankful for organizations like the School of Kinesiology at the University of Michigan, the Stanford Down Syndrome Research Center, the Pierce-Shimomura Lab at the University of Texas, the Down Syndrome Research and Treatment Foundation, and countless others. Their cutting edge research is helping to improve the quality of life for all children, not just children born with Down syndrome and autism. Walk backwards...? Sure, why not! It’s fun watching Noah reach out and grab the big ropes that hold the swing up. His tiny little hands barely wrap around them…. …but that doesn’t stop him! This kid is determined. And I love it! Now you see why we are so ridiculously proud of our little boy? Man, oh man how we love this kid. What sort of things are your children doing in their therapy sessions these days? Do you (or have you) used any of these exercise tools with your little one before? How did he or she (and you!) like them? I want to hear your story. The treadmill looks so hard. Way to go Noah before you know it he’ll be chasing a soccer ball. Love his expressions. He’s doing so much work but it’s not making him sad or frustrated. That’s great therapy. Yikes, sorry to hear about that. We’ve had our fair share of insurance issues so I know all about that. Thanks so much, we really appreciate that. We’re excited for Milania and you guys also. Please keep us posted on how everything goes! Hi! I just recently started following your blog and was just curious- why do you have to take Noah for PT and OT? Don’t early intervention services in your area come to your home? Great to meet you, and thanks for your comment. We live in a large city so there are lots of different therapy options here. We take Noah to a private therapist that we really enjoy. We tried some other therapists when he was born but just weren’t happy with them. We opted for private therapy for our daughter for many of the same reasons. We found a fabulous Neurodevelopmental Charter school that did some very innovative things when our daughter was young, she is now 16 and has found memories of the “fun” she had there. Lots of great resources for anyone willing to do some homework, and we found many ways to make it happen. As my mom used to say “when God closes a door he opens a window”. Love reminising with Noah and you all. The future is bright. I’ve got to admit, I’m a bit jealous of your amazing therapy! I had to fight to get OT once a month and PT once every 6 months (small town – no options). That’s just one more reason why I enjoy your blog so much – I get more ideas of things to try at home and be working on (Kaylen is 14 months, but I feel like she’s missed a lot of things that Noah is working on currently). Love it! My little love bug is 4 1/2 and this brings back good memories of all those PT sessions! Loved our therapists… looks like Noah loves his too! It saddens me to know that not all kids with Down Syndrome are getting access to the great therapy that will make such a difference in their lives. My son, Kyle is 11 years old and he did have access to Early Intervention and they came to us which was a blessing since my husband and I both work outside the home. I see Noah on the big yellow ball and it brings back memories of Kyle on his bluish green ball. I am struck by how much Noah looks like Kyle did at that age…not just in his face, but in his mannerisms and his body shape. I want to share a few stories about Kyle that I think you will enjoy. You mentioned Big WINS and the celebration of them. When Kyle was about 8 months old, it was Christmas time so we had our tree up. We were working on getting him to crawl and he was fascinated with the shininess of the tree. He would work really hard with his arms and make his way to the tree, not really crawling, but getting there none the less. So, I would let him get about 2 inches away and then grab his ankles and pull him back across the room. And so the game began. We did this over and over again that day and for many more days until about March when he could crawl to the tree faster than I could get to him and pull him back, so the tree finally came down. You also mentioned working to strengthen Noah’s core muscles. The other day, I was horsing around with Kyle. He was sitting on my lap facing me and I bent him backwards and poked his belly. I remarked to my husband how rock hard his stomach was. Certainly harder than mine, so I am jealous. It’s amazing to me that we spent countless hours working to strengthen these muscles and it clearly worked. One more story for now… Kyle started middle school this year. A few days before school started we went there to meet his teachers. One of them asked us if Kyle would be able to do the combination lock on his locker. I very quickly said, no, he had never even tried doing a combination lock. His fine motor skills are his weekness so we talked breifly about alternatives like using a lock with a key, or taking the lock off completely. You see, there is lot more to doing a combination lock than you think…grasp the dial, then turn clockwise, then stop at a very specific place (1st number), then turn counterclockwise past the 1st number, then stop at another very specific place (2nd number), then turn clockwise (not past the 2nd number), then stop at yet another very specific place (3rd number)…keep in mind that if you go too far you can’t just go back, you have to start all over again (quite frustrating). I am exhausted just typing out the steps. We let him try a few times that day and he was totally frustrated as I expected. They wanted to let him try for a few days before we tried alternatives, which I agreed to, but I was uncomfortable about. I did not want him to be frustrated as he started this new chapter in his life. I was certain he was not going to be able to do it (not that I told him that or would ever tell him that). So before the end of the first week of school, his teacher emailed me to let me know that Kyle had successfully done his combination. He did it that day, the next day and every day since then. He was over the top proud of himself (as was I). And this is NOT the first time that he proved me wrong when I doubted him…you’d think I would learn by now. I really admire what you are doing for Noah and now that I know about your blog, I look forward to seeing the great strides he will make with your encouragement. You are great parents!! By the way, Kyle has been watching the videos with me and he thinks Noah is adorable too. This looks SO familiar! Our daughter especially loved the swing. It was our bribe to get her to do other things that she didn’t like as much – like crawling through the tunnel, or crawling at all, and eventually the much dreaded stairs. Noah is so adorable! I wish I could reach through the screen and give him a snuggle. Now that B is 7 we’re getting sneaky with PT – theraputic horseback riding, swimming and special olympics games… The days of direct therapy weren’t easy for us. Lots of tears and frustration, and that was just me… She was not a fan! For all those still in the trenches, it does get easier, promise! I can’t say enough good stuff about the wonderful people who work in the field of PT, OT, not to mention ST which is where we spend most of our energy these days. So awesome. Thanks for sharing! My son loved the swing too like crazy!! He’s 16 now and loves the swings still!! We used the ball as well when Zach was little and it was great. At first he didn’t care for it but got used to it and loved it. We didn’t do the treadmill then this must be new. Sounds like it would really help with walking though. Noah is doing great!! Way to go!! So are you guys doing this through an early intervention program or insurance or both? We see the PT every week 1x/week. We see the ST and OT every other week (and this is just recent). We didn’t have ST and OT for a long time due to our lack of resources and the not so great resources for the Early Steps program. Soooooooo…..how do you do it? Early Steps or insurance? All of Kyle’s therapy was through the school system, paid for by the state. Before he was in school, it was in our home. Now, it is done at the school. We have been VERY fortunate that the school system’s (2 different ones in his 11 years) have walked us through the process of getting him signed up as well as providing the services. I don’t know a lot about it, but I think every state HAS to provide services. I’m pretty sure every state is different, but they have to provide them on some level. I have heard stories where parents had to fight for them which makes me sad. Just came across your blog today. Our own little guy, James, was born August before Noah. He receives Early Intervention in the home (started at 2 mos old), as well as OT, PT, and ST at a faith-based therapy center outside of town, on a ranch (started at 1 yr). We have insurance, but this particular place does not turn people away because of lack of funds. We are blessed! And James had his first experience on the swing (at least with that configuration–he’s done it sitting in a net before), and he loved it! The ball is fun if he gets to lay on his back, because he loves to go up-side-down. But I think he favorite therapy is Speech, where he gets to eat! Can’t beat that. My little love bug is 4 1/2 and this brings back good memories of all those PT sessions! Loved our therapists… looks like Noah loves his too! Oh yah. He is rocking it! Does your 4 1/2 year old still do any sort of PT / OT / ST? I LOVE LOVE that face on Noah with both his hands on the swings. Absolutely to die for! He has so much fun, it’s great. What a hard little worker. I love the ball and am intrigued by the treadmill and swing. Right now, Tyler (15 months) gets PT 2x a month and OT 2 x a month from our local Infants and Toddlers progam (early intervention). We also take him to PT quarterly at the Kennedy Kreiger Institute in Baltimore (affliated with Johns Hopkins), where he’s getting added support through their Ds clinic. Sometimes I really wonder if we’re doing enough for him. One of my biggest concerns is that one day we’ll look back and wish we would have pushed for more for him. I think its awesome that Noah is doing so well and that you found therapists you love. That’s tremendously important…as is evident with how well Noah is doing. Again…what a hard littel worker! He’s getting so strong. I was browsing your website the other day and saw a brillant little light-up toy that Noah seemed to dig. Our baby is starting to track nicely with her favorite toys (she has been following people for a while). Thought it might be a good purchase for play and therapy time. Would you mind sharing what i’s called and where you found it? Thanks! I think you are talking about the led want / globe that’s on this list…..
Am I right? If so, that’s a GREAT toy to have!